This BBC thriller, just finished its first run, comes from the pen of Line of Duty writer Jed Mercurio and is just as thrilling and well constructed. There are different levels of quality served up on the telly these days with more and more junk being churned out, but this is a top-notch quality production. 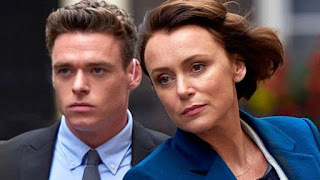 Set in the UK, Richard Madden (Game of Thrones) plays bodyguard David Budd to the Home Secretary, Julia Montague, depicted by Keeley Hawes (The Bank Job) in a climate of unrest, as she tries to pass responsibility for dealing with counter-terrorism between departments, much to the distaste of certain high-ranking officials in the secret service and police. It seems that there’s a complicated underswell of activity based around people’s departments, lives, money and ego at stake which unfold as the story travels. What’s interesting here, if accurate, is how government officials, secret service agents and the police manage risk, the systems that are in place to oversee minimising it and protecting those whose decisions will inevitably be unpopular with someone. Add into this a backdrop of active terrorism and we have the makings of a thrilling political suspenseful drama. In order to fuel the story, our hero is an ex-military man with, potentially, an agenda of his own and personal problems as a result which need dealing with. Add a lonely Home Secretary suddenly with the power of control over a handsome bodyguard, needing relief from her high-powered struggle at work and you’ll guess where yet another sub-plot might be going. Organised crime needs to be thrown into the mix as well - are things really this complicated?! - and there’s a plotline going on which the viewer really needs to pay attention to in order to keep abreast, let alone try to guess what might be the outcomes! The threads of all this are actually smartly interweaved and even for those who might get lost along the way, the climax and outcomes of the 6-part series of around 1 hour each, is logical, well thought out and dramatically powerful. 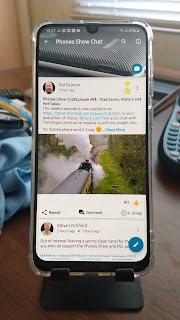 I’d better not say any more for fear of introducing spoilers, but it’s certainly good quality drama, not too long to stick with (or even binge on) and you won’t be disappointed with your investment. The supporting, mainly British cast have been plucked from a wide range of sources - from Hollywood box office loves to Coronation Street and much between! They all approach their job admirably and not once is the viewer able to muse on the quality of acting or delivery. Ladles of dark and sinister, oodles of convincing dramatics. The direction is well executed, photography interesting with attention paid to long-shots for dramatic effect along with shallow-focus and blurring to add impact and drama as appropriate. The sets are nicely presented, much of it on the streets of London but also plush office suites in the corridors of power. The pace is just right, so no chance of getting bored or putting the kettle on early as the running time flies. Highly recommended if you can see it from where you live. Certainly it’s on the BBC iPlayer for a while at least for we Brits.